853419 LEGO® Star Wars™ Magnet Set: Luke Skywalker, Emperor Palpatine and General Veers is a Star Wars magnet set released on March 9, 2012. 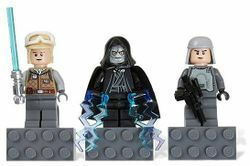 It includes three Minifigures, Luke Skywalker, Emperor Palpatine, and General Veers. The minifigures do not come off the magnets. Only heads, helmets, hoods etc. are removable. This is a description taken from LEGO.com. Please do not modify it. Bring an intergalactic battle into your fridge or locker! Collect 3 memorable LEGO® Star Wars™ characters with a magnet set from a galaxy far, far away! Includes authentic Luke Skywalker, Emperor Palpatine and General Veers minifigures, each on a 2x4 LEGO brick magnet, with accessories. Stick them to almost any metal surface to bring the legendary intergalactic adventure into your kitchen! Makes a great gift for fans of LEGO Star Wars™ building sets! Facts about "853419 LEGO® Star Wars™ Magnet Set: Luke Skywalker, Emperor Palpatine and General Veers"
Bring an intergalactic battle into your fridge or locker! This page was last edited on 19 October 2016, at 22:12.